What disturbs me in this case most of, and I gather from my colleagues who sit here a lot of the time would agree with me, is the lack of supervision in this holding facility. The public, particularly people if you can make a distinction, particularly people who are incarcerated awaiting trial being subject to what was going on in this jail. The province should not be permitted to keep people in jail if they are not prepared to supervise it and to ensure that people are not injured while they are sitting around in a jail. This should not happen. Somebody should be doing something about it. I am not the person that should be doing anything about it but I am certainly able to comment on it. It fills me with concern for the people who are being held in custody under supervision of this province. The Sarnia Observer has been following the story of overcrowding and dangerous conditions at the Sarnia Jail since August 2009. “A ticking time bomb is ready to go off at the Sarnia Jail and unless the province reacts to a volatile situation, more violence is inevitable. The newspaper has reported on an escalation of violent incidents occurring at the jail over the past year. Sarnia courts in recent weeks have heard of a man whose nose was almost ripped off in a shower assault at the jail and of two inmates who were seriously attacked with a piece of concrete wrapped in a bed sheet. It`s not like authorities were not warned that this would happen. Regional officials were warned by the jail guards union that the situation could turn deadly unless changes are made to the facility. It`s a scary situation which leaves staff with less control. While offenders face the possibility of additional charges, it`s a small deterrent for a criminal who is already coming before the courts on other charges. To its credit, the union has presented design plans to the Ministry of Community Safety and Correctional Services calling for more holding cells for problem inmates. Appropriate action in this case would be to renovate the Sarnia Jail immediately to protect both guards and inmates. The present system only promotes violent acts to occur. “Responding to a recent escalation of violence at Sarnia`s overcrowded jail, a spokesman for the guards` union says he warned regional officials the situation will turn deadly unless changes are made. “I`ve never seen more assaults. Now inmates are getting seriously hurt..Someone will die if something isn’t done“. Esser said transfers from other facilities and long waits for bail hearings have swelled the inmate population to more than 100 in a facility built to accommodate a maximum of 55. The jail guards together have a duty to protect inmates. More surveillance cameras and beefed up supervision could reduce the number of attacks, he said. “When the province says “OK, we`re in charge of you“, there is a corresponding duty to protect that person. This is clearly not being accomplished. Local judges have begun taking the situation into their own hands, providing sentencing credit for inmates sometimes housed three to a cell. “The first blow caught Wally Nace on the back of the neck. Stunned, he dropped to his knees and covered his head. Then punches rained down from all sides. Why is all of this happening in our jails? Par of it is lack of rescources. But another huge part is th guard culture and the secrecy amongst the guards. We learned all about that culture in the recent case of Jean Paul Rheaume who was beated violently by a number of guards in an Ottawa prison. Here is a link to an article from the National Post on the Jean Paul Rheaume beating along with the prison guards’ criminal proceedings. 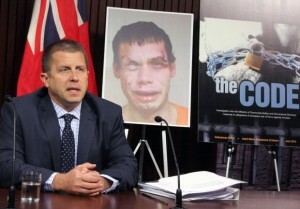 The reality is that these sort of jail house beatings are taking place all over Ontario. The London ON jail was recently called a living hell by inmates and guards alike. A recentl law suit targeted the London Jail for its outrageous violence and unsafe conditions. The goal of the justice system is rehabilitation and re-integration in to society. It’s not putting wrong doers in to a situation wich only fosters a culture of greater violence and brutality. If it’s not safe for the inmates, it’s not going to be safe for the guards either. Enough law tal? Sure. Pinch me right nowbecause Toronto’s professional basketball team has the BEST RECORD IN THE NBA. I must be dreaming!